Over 120,000 people live in poverty in our own community. United Way creates pathways out of poverty in our community by investing in three focus areas and working together with funded partners, government and community organizations. Together, we will move beyond managing the symptoms and work toward ending poverty. No other organization offers a broader range of solutions, impact and results. The best part? It’s 100% local. 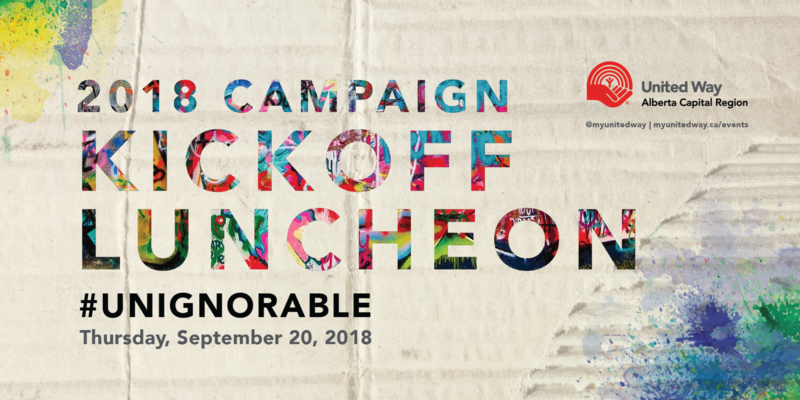 Help launch United Way’s 2018 Campaign by joining dozens of local businesses at the charity Kickoff Luncheon on September 20th, and learn how you can take action against the #UNIGNORABLE issue of poverty. Date: Thursday, September 20th 11:30 a.m. to 1:30 p.m. Please book your seat by September 17th! Please Note: This is a ticketless event. United Way staff will direct you to your table.